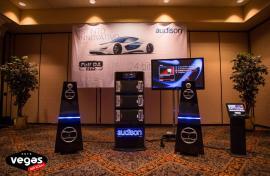 Audison presented Full DA HD technology to Vegas Show 2015 (January 6 to 8). In the Audison Full DA HD listening room was possible to compare in real time the sound of a source with compressed audio tracks, with that of Audison bit Play HD playing high resolution audio tracks. The tower speakers use Thesis drivers in multi-active amplification with two TH 1 for the subwoofers and one TH 2 for the tweeter and woofer, all managed by an Audison Bit One processor. In the room was also display a prototype of the Audison future processor Bit One HD, able to elaborate the signal at 24-bit / 96 kHz without any down sampling. The demo car VW e-Golf, all-electric, was set up with an Audison Prima system perfectly integrated with the cabin, to the point of being indistinguishable from the original.